Okay, I cannot resist. The image above is a 1953 Indian Chief motorcycle — I’ve never been on a motorcycle, let alone owned one, but even I know the mystique that surrounds the Indian Chief. The picture is there because a 1953 Indian Chief bike is a central (albeit non-speaking) character in Drew Hayden Taylor’s first novel, Motorcycles & Sweetgrass. The novel is strange enough that, if you object to a review of it being introduced with a picture of a motorcycle, I am sure you will not like it. If you can accept the image (do you realize that KfC will now be getting a large number of hits from googlers who are looking for pix of an “Indian Chief” motorcycle? ), then read on, because I suspect you might want to consider the book. Motorcycles & Sweetgrass is part of Knopf Canada’s New Face of Fiction series, but that is a bit misleading. While it is Taylor’s first published novel, he has an impressive resume. An Ojibway from the Curve Lake First Nations, he is also a stand-up comedian of note, a playwright and journalist and, perhaps most important, has worked on a number of television series and documentaries. This novel started out as a script for a “cool movie”, in the author’s own words, and it is worth keeping that in mind when you read the book. Manifest Destiny, as the White people to the south believed, dictated that this little Anishnawbe girl be removed from her home and sent away to be taught about the Battle of Hastings, dangling participles, and how to draw a pie chart. For a year or two anyway. Starting tomorrow. And this man, who’d come into her life a few months ago, was about to be left behind. “It’s your new boyfriend, isn’t it. What do women see in him?” the man asked. Virgil had a much better view of the motorcycle that was coming up his grandmother’s driveway. An old one, by the looks of it, but in immaculate condition. It glistened in the sunlight as it stopped by the side door. Like most boys his age, Virgil had more than a passing interest in gas-powered vehicles, especially anything that could be classified as “cool.” And this scarlet vision before him put the word cool to shame. It was red, with white trim, old-fashioned headlights, a black solo seat complete with fringes made from what appeared to be black leather, and larger-than-normal wheel fenders. Hanging from the end of each handlebar was a feather, but each was different. The feather on the right looked like it had come from an eagle. But the one hanging from the left was darker, smaller, shinier. The rider of the motorcycle is young and white and he finagles his way past a couple of Lillian’s protective sons into her room. They talk and he kisses her passionately, despite the decades of difference in their ages. Virgil sees it all and does not really understand but he knows that he should be worried. From here on in, you need to be willing to accept the mystical and the magical to continue with this book. Both John the motorcyclist (he will use a number of last names and the color of his eyes keeps changing) and Virgil have embarked on a voyage of discovery. A number of other characters, both human and animal (raccoons become particularly threatening — you will note their presence on the book’s cover), will play a part. It is also at this point that the author’s screen-writing talents start to takeover as Taylor juggles (quite successfully) a number of subplots. Some are quite funny. For example, the band has purchased a large piece of adjoining property — Maggie is more or less continually beset by band members who have great (and conflicting) ideas about what to do with it. She also has a younger brother who has spent the last few years on an island in Otter Lake, where he is inventing a First Nations martial arts form. Virgil recruits him to help sort out the puzzle of John the Motorcyclist. Taylor moves back and forth between the mundane and the mystical. While it makes for a fast-moving and quite readable book, in the final analysis it is not much more. There is nothing the matter with that (particularly if you are looking for a bit of escapism). Motorcycles & Sweetgrass is an entertaining first novel (if you know the work of Thomas King, another First Nations writer, you will find yourself in familiar territory). 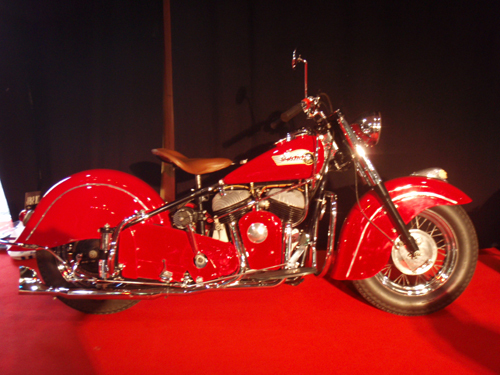 And for those who know and appreciate the almost iconic reputation of the Indian Chief Motorcycle, its role in the novel alone makes the book worthwhile.